Best Rated 55-inch TVs Comparison & Reviews (2018-2019) – This page contains a roundup of all of the top-rated 55-inch LCD, LED, and 4K Ultra HD, and 3D Ready TVs, presented here for a comparison of price, features, and reviews. This size is good for medium to large sized living rooms. You can check what size you need by consulting our HDTV Sizing Guide. For 2018-2019 we are seeing many more 55-inch 4K Ultra HD TVs available. Most 55-inch LED TVs have 120Hz or 240Hz anti blur technology, and LED backlighting. The best-rated midrange and high end TVs are now 4K Ultra HD TVs, as this is quickly becoming the new standard in TVs. This is the same resolution as the 4K projectors in your movie theater. Click on the reviews link underneath each TV to see owner reviews and ratings for each model for easy comparison. 4K Ultra HD (UHD) = 4K is the new standard in TVs. It has 8 megapixels of resolution, which is 4X the resolution of Full HD 1080p TVs currently on the market. This allows you to sit closer to the TVs as the pixels are smaller, and will give you a more immersive movie theater type of experience. Smart TV = A Smart TV is one that can access the internet, most have an internet browser, and will give you access to programming such as Youtube, Netflix, Amazon Instant Video, Hulu Plus, and more. Most Smart TVs have apps that can be installed on your TV. 802.11ac WiFi = This is the latest Wireless WiFi standard, and provides the fastest speed for streaming HD and Ultra HD 4K content. OLED TV = OLED displays have no backlight, as the screen is self illuminating, giving better picture uniformity and deeper blacks. They have high contrast, wide viewing angles and display fast action (sports, action movies) better without blurring. They are very thin, and highly energy efficient. 4K TV (2160p) = (3840×2160) with 8 million pixels resolution. Internet Ready = This means that this TV can give you content from the internet. Content varies with the manufacturer. This TV will provide an ethernet port to connect an ethernet cable. Or you can buy an optional Wifi USB plugin device to send the internet wirelessly to your TV. Some provide Netflix and youtube content. Dual Core/Quad Core Processor = A dual core TV has two processors instead of one, which will speed up TV operations, especially the Smart TV internet functions. A quad core TV has four processors for even greater speed. Triluminos LED = This is Sony’s best Panel. Only available on their high end 4K TVs. The panel will give you a larger color palette than normal LED TVs, and depth of picture. XReality Pro/4K XReality Pro = Sony’s top image processors are in their high end sets. This processor will upscale video, and give a better picture than TVs with inferior image processors. 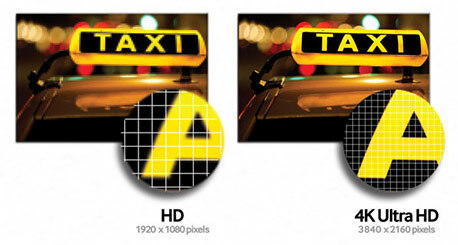 HDMI® 2.0 Support = HDMI 2.0 is the next generation of HDMI which will provide higher framerates for 4K Ultra HD content. Sony offers a free upgrade to HDMI 2.0 for its 4K TVs.